True blue Ikea Antilop loyalists like me will know that on the scales of price and wipe-ability, the Antilop is tough act to follow. So I was intrigued to learn that Ikea has a new high chair on offer: the Blames. Will it capture our hearts? 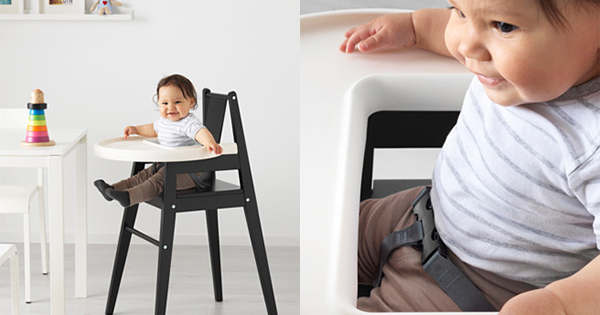 Behold Ikea’s Blames, a slick wooden high chair with a removable plastic tray. Like the Antilop, it’s got tilted legs for stability, the surfaces are without grooves, which means no more digging crusted purées out of cracks with a BBQ skewer. After that, the silmilarities end. Blames is solid wood, comes in red or black, and it looks downright fancy. A baby in a knit tie and skinny jeans would take to the Blames like a hipster to an old timey barber shop. It’s got all the practicality of a good Ikea product, and the design chops of a boutique piece of furniture. All that for $99 isn’t bad. It’s undeniable that the Antilop is unbeatably awesome for the price, but it’s tough to resist the minimalist, contemporary lines of the Blames. Are you team Antilop or team Blames? At this moment, I’ll admit I’m tempted to change sides. Check Ikea’s website for Blames availability at your local Ikea store.